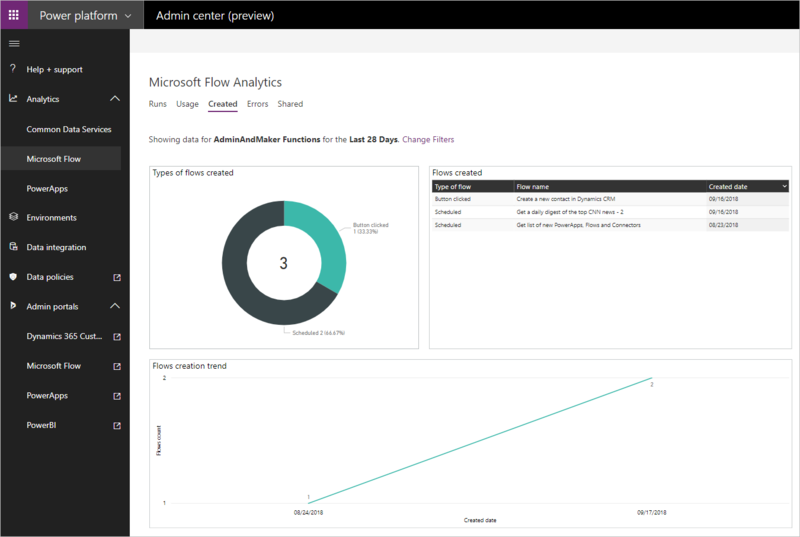 For those of you who are familiar with the Microsoft Flow Maker Analytics that we previously shipped, the Admin Analytics for Microsoft Flow will look and feel very familiar. We are providing the same Power BI Embedded experience, but with an environment-wide view point. 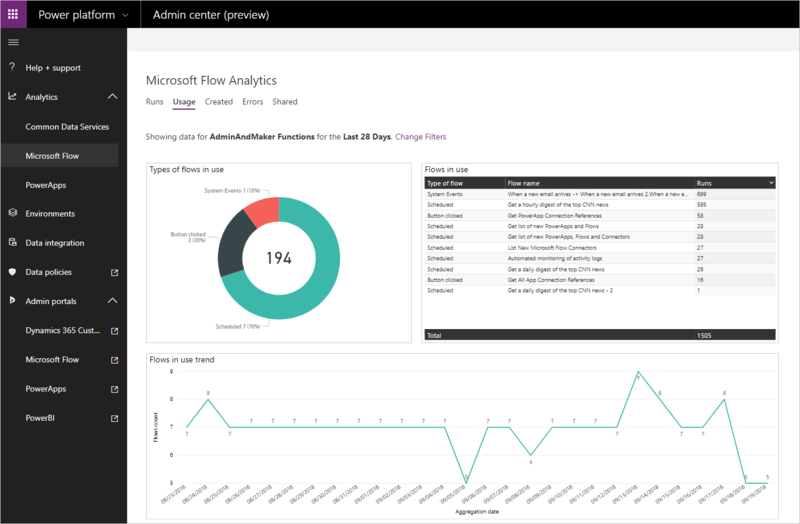 Why did we build Microsoft Flow Admin Analytics? We built Admin Analytics as a result of customer feedback. Our customers want more visibility into how their organization is using Microsoft Flow. They also want quick access to insights that allow them to govern and provide change management services to their users. What is required to access Admin Analytics? During this preview release, tenant administrator privileges are required. In addition, a Flow Plan 2 license is required. Note: During this preview, you will also need to be part of the Environment Administrator role for the environment that you wish to view Analytics. This permission can be set within the existing Flow Admin center. See the Roadmap section of this post for additional information. Data is retained for 28 days and never leaves the region that your environment is hosted in. However, we do provide filters that allow you to view 7 and 14 days worth of data. Much like other Power BI dashboards, yes you can export data by clicking on the Export data label within the visualization menu. What is the scope of data presented? We provide analytics from a per-environment view point. You can select your environment by clicking on the Change Filters link or the Filter icon in the upper right-hand corner. What reports are included in Microsoft Flow Admin Analytics? Runs provides a Daily, Weekly and Monthly view of the Successful, Failed, Cancelled and Total flow runs within a specified environment. Usage provides insights related to the types of flows that are in use. This includes Button, Scheduled and System Event flows, all broken down by the number of runs and the trend over a configured timeline. Created provides insight into the different types of flows that have been created. This includes Button, Scheduled and System Event flows, all broken down by the number of runs and a trend over a configured timeline. Errors provides insights into flows that may be experiencing issues. The errors will be broken down by error type so that you can look for common problems that may exist. In addition, we will provide the total number of errors that have occurred within your configured timeframe. We will also provide you with a Last occurred timestamp which will provide an indication of how recently the last error occurred. Shared provides insight into the flows that have been shared within an environment. We will include the type of flow including Button, Scheduled or System Events. In addition, we will provide the name of the flow that has been shared and the number of shares that have taken place including a timeline of these share events. As mentioned earlier in this blog post, this is an initial preview of our Admin Analytics. Our team is already working on our next release which will include more details about who owns these flows that have been used, created, shared or have errors. In addition, we will be providing a Connectors report which will outline which connectors are being used within an environment. In addition to the enhancements that will follow this initial release, we will also be working on more granular access to these reports so that Environment Admins have access to these reports without requiring tenant administration privileges. We also want to provide aggregated tenant-level analytics so that you can see summary level information across your entire tenant. What else would you like to see included in these analytics? Please provide comments below on any features that you would love to see included in this analytics feature.